For anyone who has been following me for a while, you may remember a while back I wrote a post about creating a secret garden. I completed phase one back then, and created a Pinterest page to keep track of my vision. If you'd like to follow me on Pinterest, here's the link. Anyhooooo....fast forward three years, and I still have that vision, it just hasn't gone any farther. Life gets in the way, and there's always another project to be done. I've been trying to really formulate the vision in my head, and I feel as if I need to determine the nature of the path first in order to establish the 'lines' of the garden. So, guess what I've been doing? 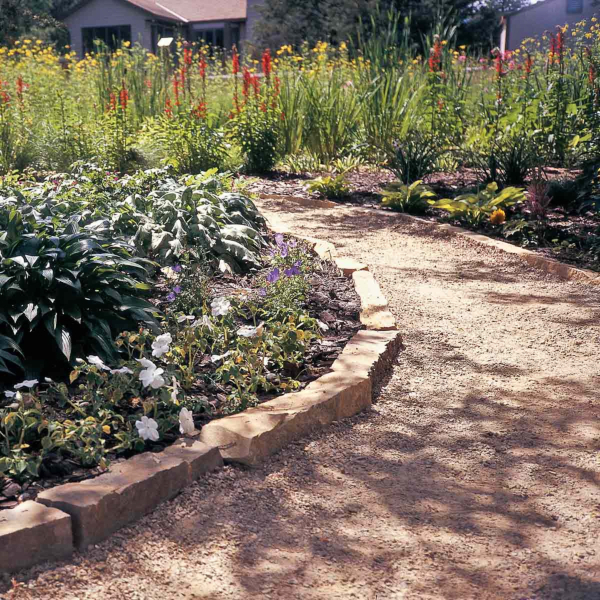 Researching cheap and easy ways to make a garden path. Because, you know....that whole budget thing. Yup, it's always there, lurking around every corner. I don't want anything fancy, just a simple country path. 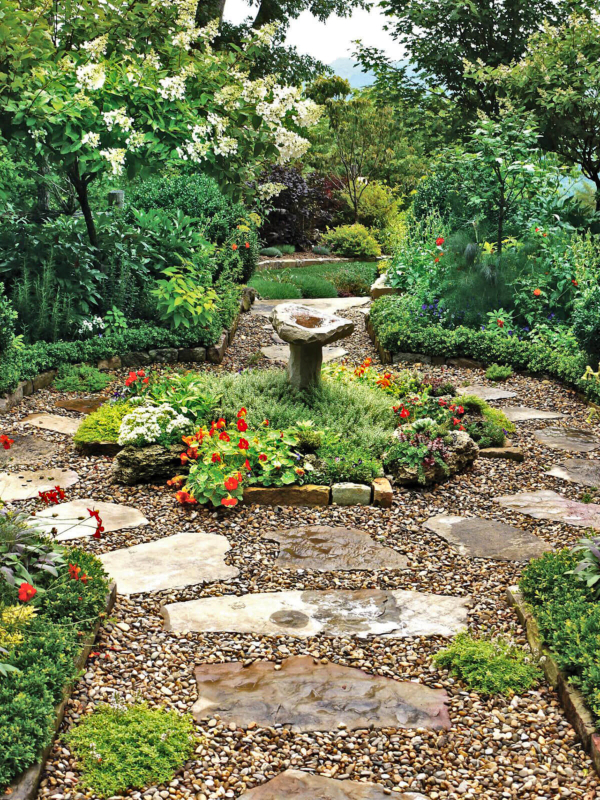 I have some leftover paving stones from a couple of other garden projects, so I may just use those to line the path, like in this photo. The only problem is, I'm not sure how many paving stones I have left...I may not have enough for this. We'll see....fingers crossed. Alternately, I have about a billion big stones that have been dug out of the ground that need to find a home....I could always use them as edging. Thank God for Bee, that's all I can say about that. My basic plan is to figure out the shape of the path, lay cardboard down along it to kill the grass/weeds, cover it with landscape fabric, run a border along either side and fill it in with either gravel or mulch. Easy peasy, right? Well, it will be labor intensive, but at least I'm not digging. I want the path to lead from the driveway up near the garage to a small sitting area under the big maple tree. 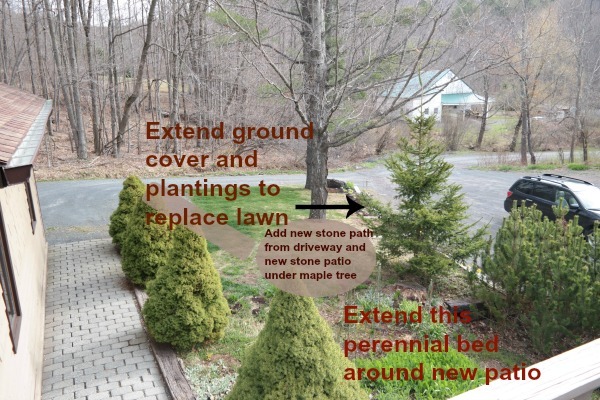 On either side of the path will be plantings, similar to the above photo, and hopefully I can completely eliminate what (barely) passes for a lawn in this area. 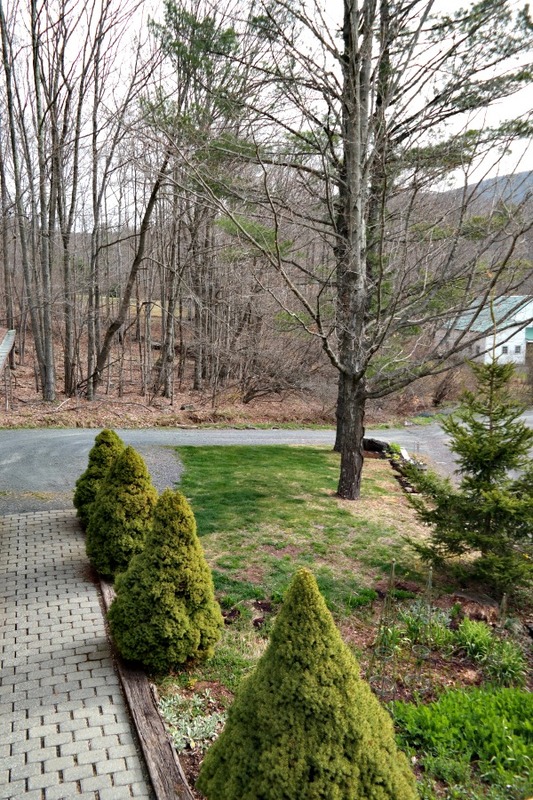 This is the area I'm looking to revamp, as viewed from my deck. These photos are from my Secret Garden Post....unfortunately right now there's still snow on the ground and not a bit of green to be seen in the garden. Here's a basic idea of what I want to do....but I do not want a straight path, I want curves and movement. I want this to be a place I love spending time....not just a place I hate mowing. There will be an arbor at some stage of the path, which I will make out of saplings I cut from the woods. I did the very same thing in a previous garden, and I loved it. There's a great guide on how to do it in this post. Since my house is surrounded by forest, there's no shortage of saplings nearby for me to use for that project. It's going to be a big project, and no doubt I will need to work in phases to get it completed. I don't even know if I'll complete it in one season...chances are I will not. But I think I'm ready to at least get started. Do you have any big projects in the works this spring? It sounds like you have some great plans! We will be planting more flowers and shrubs around our French pea gravel courtyard. I am turning an old water fountain that leaks into a planter, and I will be planted my veggies in my galvanized raised beds. I am looking forward to getting out there! You and me both, Penny! I made a small amount of headway in the garden on Saturday, and then Sunday the wind blew the leaves right back into the beds I had cleared out! Plus we woke up to snow again today - hopefully it won't stick around long! I love the ideas you have! 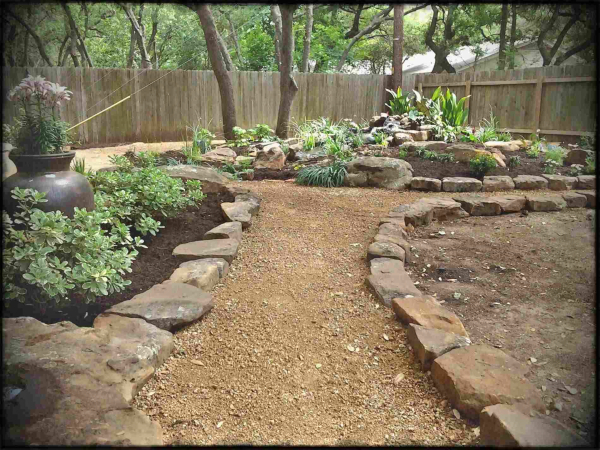 I also want a garden path in our backyard...it is very small but I think I could work a small area in somewhere. Can't wait to see how yours progresses! Love and hugs sweet friend! I hope I have the strength to accomplish this, Benita! It's going to be a lot of labor, of course! 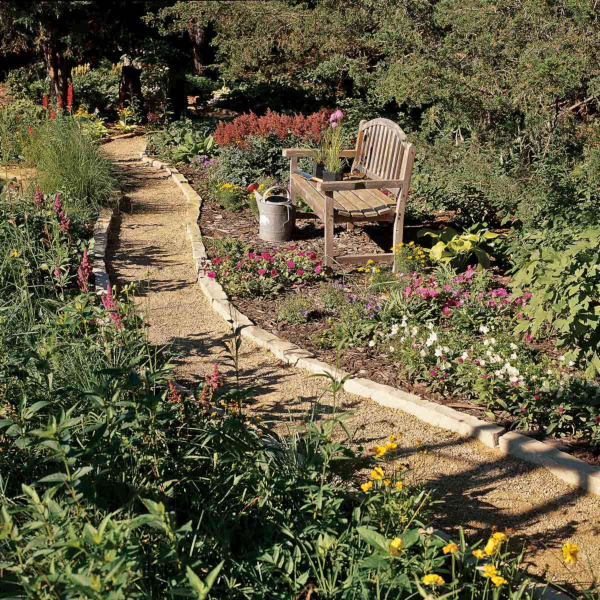 I like all the inspiration for making your garden walking path. I hope you have enough pavers. Can't wait to see it this summer. Me too, Kris! I can't wait to transform that horrible excuse for a lawn into something a lot more appealing! I dread the hard labor, though....wish me luck on that! I love garden pathways. They look so romantic and cozy. Don't know that I could do it on cement though. I'd have to really think on that one! Hmmmm that would be a tough one, Brenda! You could always create the illusion of a curving path by lining up something small in the shape you like small flower pots....and there's another way you could do it, I just sent you a link! What a great plan! We have the teeny tiniest path in my yard, seriously, it's like 6 feet long. I love it though, there are pavers on each side and stepping stones set in gravel. I hope your snow melts soon so you can get started! You and me both, my friend! Today was a decent day, sunny but cold....hopefully some of it melted with the snow. I plan to plant my Loofahs next weekend. I think the threat of frost will be gone. I hope. I also plan to start some sunflowers and maybe some cucumbers. I love sunflowers but every time I plant them the critters eat them within a day or two, Lisa!! That second to last picture! love everything about it. I look forward to your reveals as you go, so thankful the snow has melted here! Although today it's sunny, the wind is whipping and cold. I love that one, too, Karen Ann!! I'd be happy with any of them rather than that scraggly patch of grass/weeds I have now! Debbie, I had that next to the last picture printed out and taped up in my kitchen for almost a year as inspiration. And last spring RH copied it as much as possible in our garden! 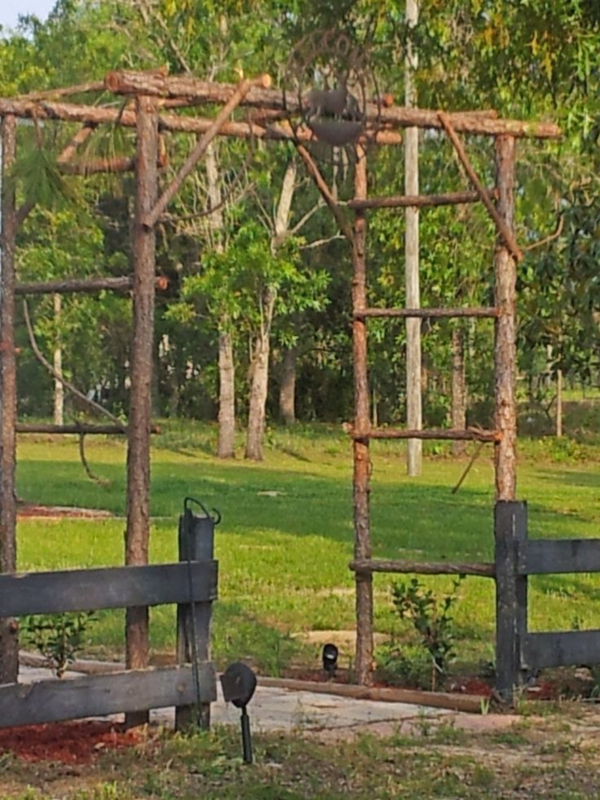 But in the center he put a large old cupola to sit over where the old well cover was, with flower beds around it. He used TN crab orchard stone for the pavers and brown pea gravel between. I love it so much! 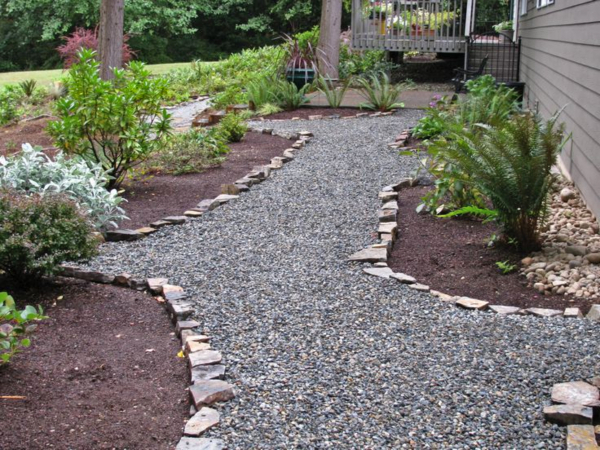 I hope you can incorporate some of the big stones you have from your property in your new paths as well as the pavers. What did we ever do before Pinterest? Wow, Dewena, I hope you post a picture of that on your site this summer when things are in bloom, I would love to see it!! I'm looking forward to seeing the progress you make on this project. 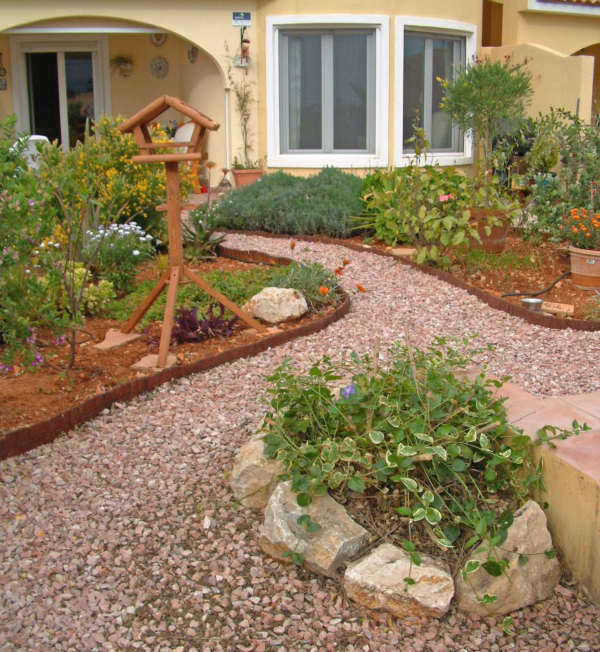 I love the sound of walking on a gravel path in the garden. It seems so relaxing. Yours will turn out beautiful like everything you do. Good luck. That's funny, PJ, I love that sound too!! I'm a little nervous about starting this project, because I know it's going to be a ton of work....and I already have so much to do! Wish me luck! Isn't Pinterest the best? Such good ideas! It's going to be a lot of work, but so pretty! I have no idea what we did before Pinterest, Mari! I refer to it constantly when I am trying to figure out a project! This sounds like a great plan, Debbie! I hope you can at least get started this spring. We have a path from our porch to our side patio and it's lined with hostas and pachysandra...plants that don't need any maintenance. That's where you have your ladder, right? I like that sweet space of yours, Melanie! Apologies for being behind. Your plans sound magical. You have grand plans. I love the idea of using natural rock on the sides. Using pea gravel for the pathe would be great. Did that in our old house. Allows great curves and compacts great. Oh if only I hit the lottery and could hire a crew to come in and do all the hard labor for me, Cindy!! My biggest project will be to organize my main closet... again! ;-) Thanks for sharing on Homestyle Gathering! I'm sure you project will be beautiful!